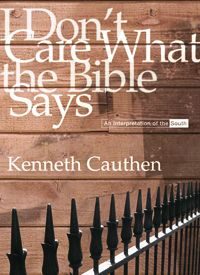 A theological interpretation of the South Kenneth Cauthen Southern history can be illuminated by the categories of the unjust, the tragic, the ambiguous, and the demonic, as defined by Kenneth Cauthen. This book provides a unique interpretation of some of the darker sides of Southern history that adds to previous understandings of the history, religion, economics, politics, and culture of that special region. No one else has written about the South combining these interpretive categories into a single narrative. While Cauthen does not seek to present new facts about the South, these facts take on new meaning in this lively and provocative interpretation. Issues of race, class, culture, and the complex relationships among them are illuminated by bringing to bear the interrelated and interacting factors of injustice, the tragic, the demonic, and the ambiguous. The work cautions against a shallow moralism that sees events in terms of a simple conflict between good and evil, right and wrong. It also warns against exaggerated notions of human freedom that puts no limits on what might have been if people had only chosen differently and suggests that the total complex of conditions under which moral agents exercised their powers of choice in the South were such that the course of Southern history took was highly probable and to have been expected.